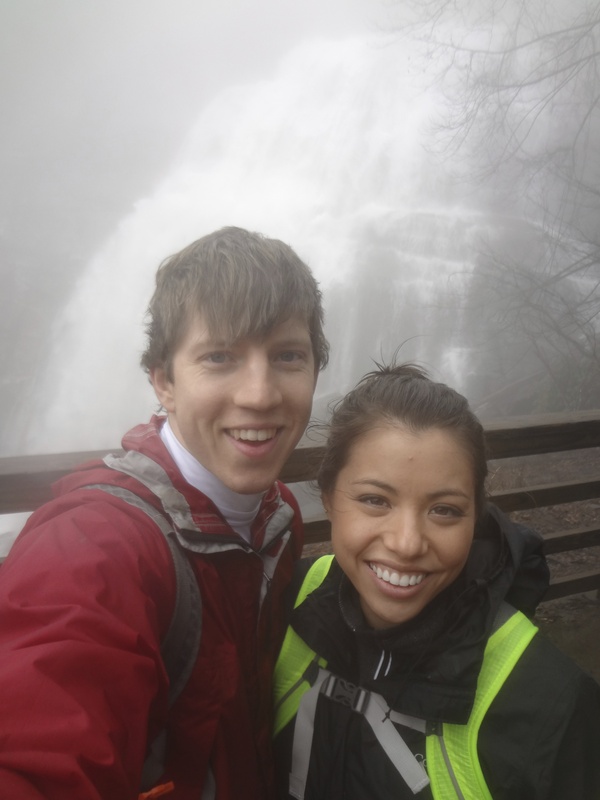 Just got back from a fun, short trip to North Carolina to visit my sister. Was hoping to get away from the cold here in Michigan but it ended up actually being colder there than here. Oh well, what can you do, at least they didn’t have snow! Just a lot of rain. Fortunately we were still able to make the best of the trip and we were able to get some good hiking in, which was of course, my favorite part of the trip. 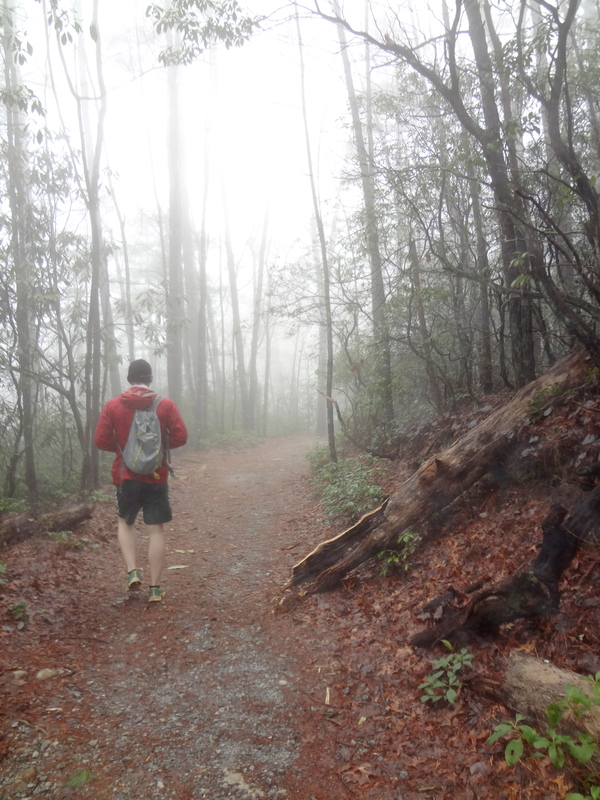 Hiking is a great way to workout, mostly because it doesn’t feel like working out. You’re still working hard and breaking a sweat but it’s just so invigorating. There is something about being out in nature that energizes you. Sometimes, especially in the winter, I find myself getting stuck in a rut. I get sick of going to the gym all the time and working out becomes less enjoyable and seems more like a chore than something I should be enjoying. 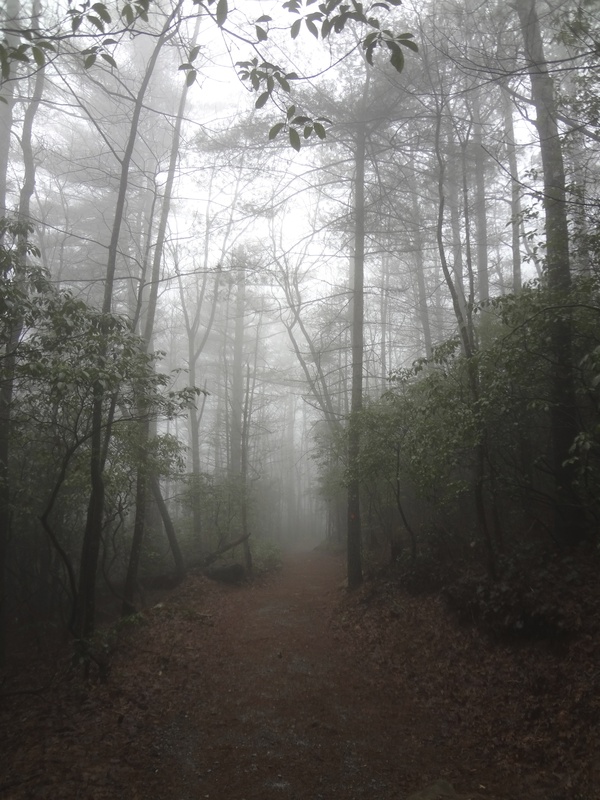 Hiking is a relaxing way to get a good workout in. It can be as difficult or as easy as you want it to be depending on the difficulty of the trail you choose and how quick of a pace you go. 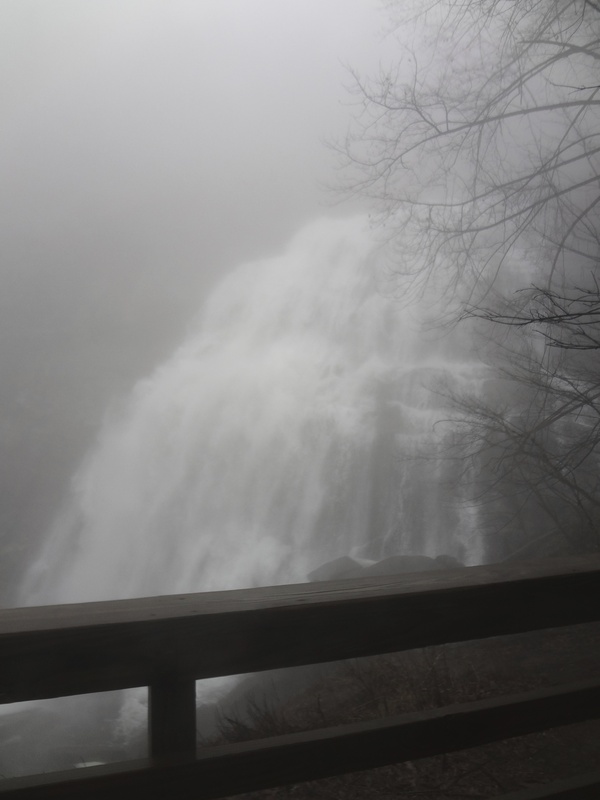 Our hike was to Rainbow Falls in North Carolina. Even though it was only a total of 3 miles my fitbit tracked that we climbed almost 80 flights of stairs in that short hike! 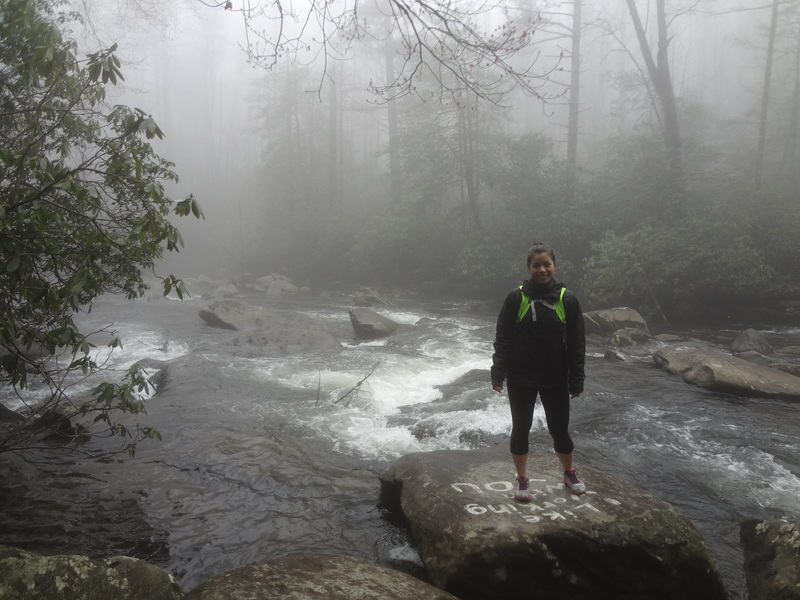 Unfortunately, hiking is not something that can be done everywhere. Here in Michigan you’ll be pretty hard pressed to find trails of that difficulty. However, you can find some that are less strenuous and it can still be a great way to get outside and get moving to break up your workout routine. Weather can make hiking difficult (it’s a lot less fun when it’s snowing and cold) so it’s good to have other options to get outside. Cross-country skiing and snowshoeing are two great options for a good cardiovascular workout. HIIT training, have you heard of it? Well, according to ACSM its one of 2014 top fitness trends. HIIT training or high intensity interval training has become quite popular in the last year and for good reasons. But before I get started on that, if you don’t know what HIIT training is, this is how it works. HIIT training is a type of cardiovascular based workout, but instead of biking or swimming or running for 30 minutes or more at a moderate intensity, it alternates between sprinting and resting. The high intensity intervals are generally performed anywhere from 30 seconds to 5 minutes, with a recovery interval that is equal to or longer than the high intensity interval (“High intensity interval,” ). Significantly increased aerobic and anaerobic fitness. Decreased fasting insulin and increase insulin sensitivity. Reduced abdominal and subcutaneous (just under the skin) fat. 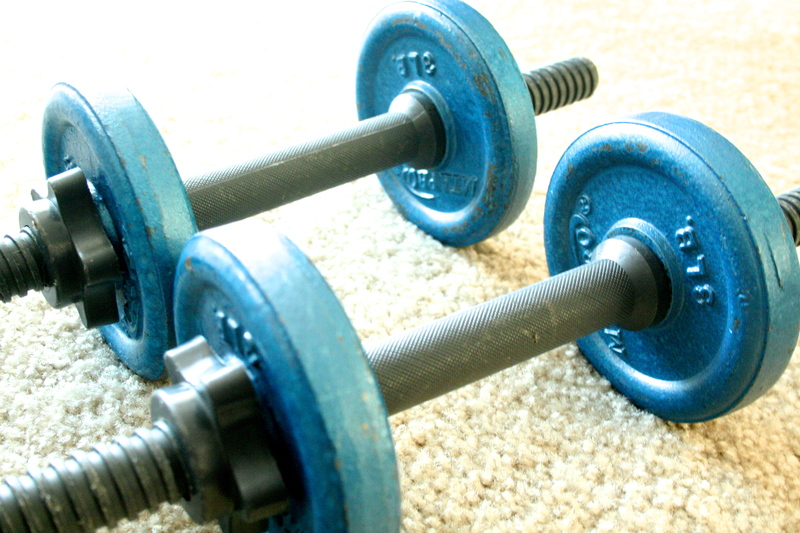 HIIT training is also an incredibly efficient way to workout. Just 15 minutes 3 times a week can burn more calories and fat than running for an hour at a moderate intensity (“High intensity interval,” ). Participants in a study were compared in a 20-week endurance training program vs. a 15-week HIIT training program. Despite the lower energy costs and the shorter program, participants in the HIIT training showed greater reductions in body fat (Tremblay, Simoneau & Bourchard, 1994). No wonder it’s so popular! Another great thing about HIIT training is that it’s not only efficient but adaptable as well! You don’t need any equipment to do it. Just get your heart racing, you can adapt it to whatever space and time constraints you have. It can be high knees in place or jumping rope or sprints down the sidewalk. Make it what you want and make it fun! If you are looking at trying HIIT training it can be difficult to decide where to start. There are so many variations that there is not really a set protocol (which is what makes it such a flexible routine). The best thing to do is experiment with shorter and longer periods of speed and recovery times to find what works best with you. To avoid injury it is suggested to do HIIT training only 1-2 times per week and as always if you are thinking of starting something new, make sure you consult with you doctor to make sure this type of exercise is okay for you. So, there you have it, a great way to get the full benefit of your workout even in a time crunch. I miss flour tortillas. 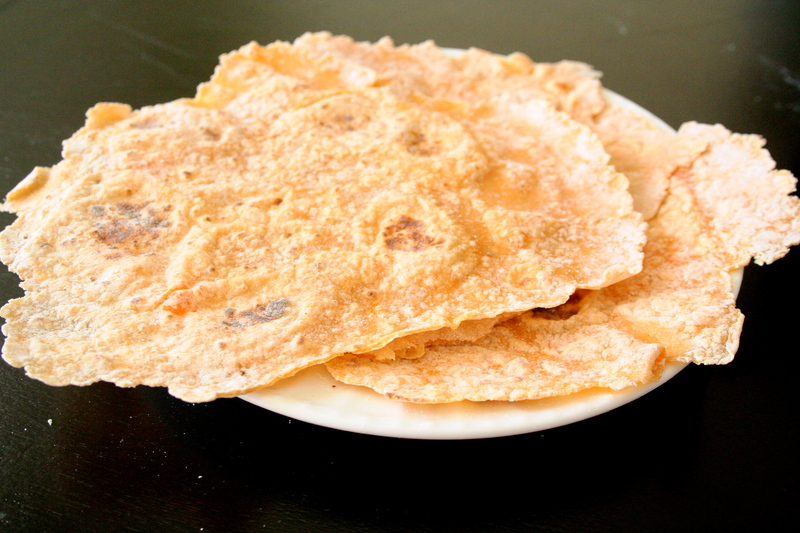 I mean, I love corn tortillas and everything but sometimes I just want a good old quesadilla with a crispy flour tortilla. A quesadilla is just not the same with corn shells. 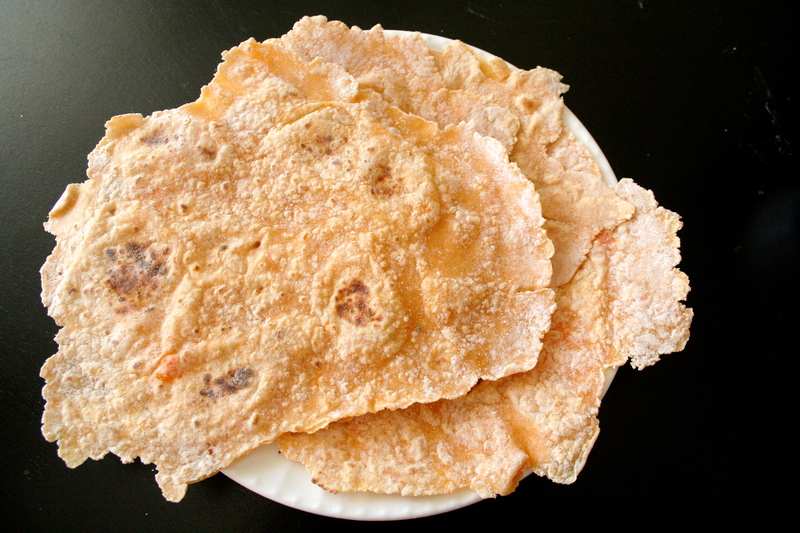 I have tried the store bought GF tortillas and still have not found one I love. 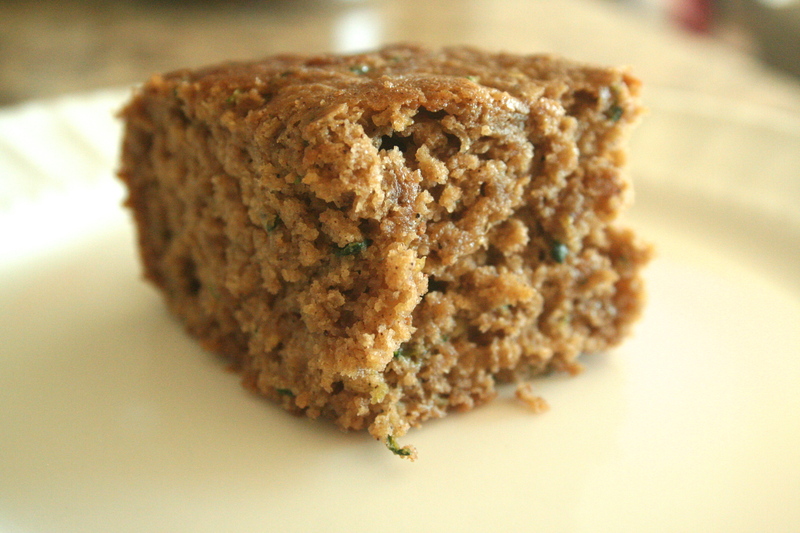 Then I stumbled across THIS recipe from gf and me (if you are gluten free and haven’t check out gf and me yet…you’re missing out, they have some pretty awesome stuff) I made them twice and loved the chewy texture and the taste. The only problem I had was rolling out the dough, I found it to be very elastic and I couldn’t get them as thin as I wanted. Don’t get me wrong they were still amazingly delicious, I just wanted them thinner. I never really thought about trying to adapt the recipe till one day I was sitting on the couch with some Trader Joe’s Sweet potato corn chips and hummus and I thought to myself, “ Hey! I love these so much I bet sweet potatoes would be good in flour tortillas too!” So, naturally I used the best flour tortillas recipe I had and added some sweet potatoes. When I originally thought to add the sweet potato I was going for flavor. I wanted to be able to taste that sweet potato flavor like I could with the corn chips. Well, they don’t really taste like sweet potatoes, not even a little. So I failed there BUT what did end up happening was a slight change in the texture of the dough (not to mention they are now a really pretty orange color). The sweet potatoes made it so I was able to roll the dough out really thin, without tearing! Plus they still kept that great chewy texture and taste I loved from the original recipe. So, I am officially in love with these tortillas. I was so excited I even made chicken quesadillas that night for dinner and they were AMAZING. They are also awesome dipped in hummus or wrapped up with some peanut butter. If you don’t like sweet potatoes or just don’t have any on hand try out the original recipe, either way you will end up with some pretty fantastic GF tortillas. Now I just need to figure out how to make that sweet potato flavor come out more. I’ll let you know if I do. Till then, enjoy! With if fork poke some holes in the sweet potato, wrap it in a damp paper towel and microwave for 5-6 minutes depending on the size you can bake it too, but for the sake of time I just microwaved it). While potato is cooking mix all the dry ingredients together in a large bowl. Peel off the skin of the cooked sweet potato and discard, mash the insides and add to the flour mixture. Using a fork mix as well as you can, mixture will be crumbly. Add the water starting with just the ¾ of a cup. This is when you will just need to use your hands to mix it. Once you mix it as much as you can add the 3 tablespoons one at a time. If the mixture is too dry you can add more water or if it seems good after just one or two of the tablespoons, stop there. The mixture should be stretchy and slightly sticky but able to hold form in a ball. You don’t want it too wet or you won’t be able to work with it. Some sweet potatoes contain more moisture than others that is why the amounts of water can change. Once the dough is formed cover with a damp paper towel while you prepare your rolling surface. Dust the counter or baking mat with some cornstarch. Rip off a golf ball sized chunk of dough and roll out as thing as you can with a rolling pin. If you have a tortilla press that is even better. I had a hard time getting mine perfectly round but it can be done if you rotate it a lot when rolling. If it starts to stick make sure you are keeping it lightly dusted with cornstarch. Once you have rolled out all the dough. Heat a nonstick pan to medium high. Cook the tortillas about 20-30 seconds on each side. Or when the dough puffs slightly and gets some nice brown spots. Place on cooling rack to for a few minutes. They will cool quickly then you can stack them. If you just place them on the counter or stack them when they are hot they can get soggy from the steam. 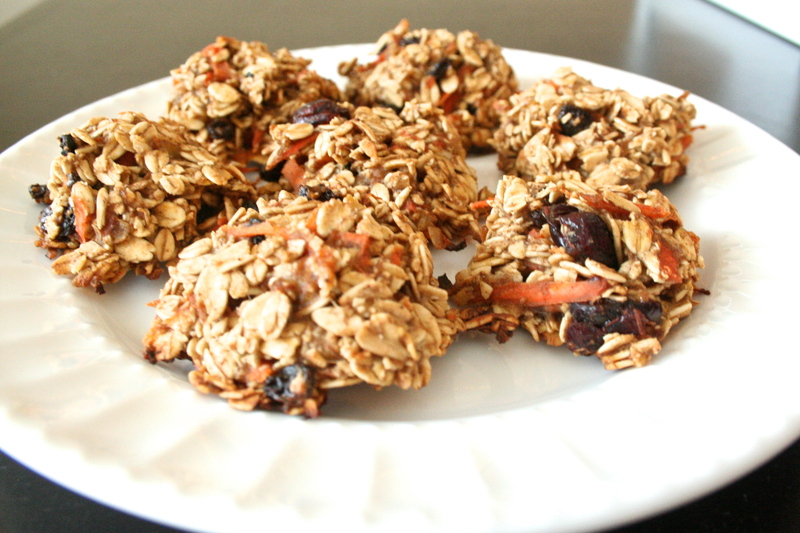 These little oatmeal bites are maybe one of the best grab and go snacks or on the go breakfasts. What so great about them? 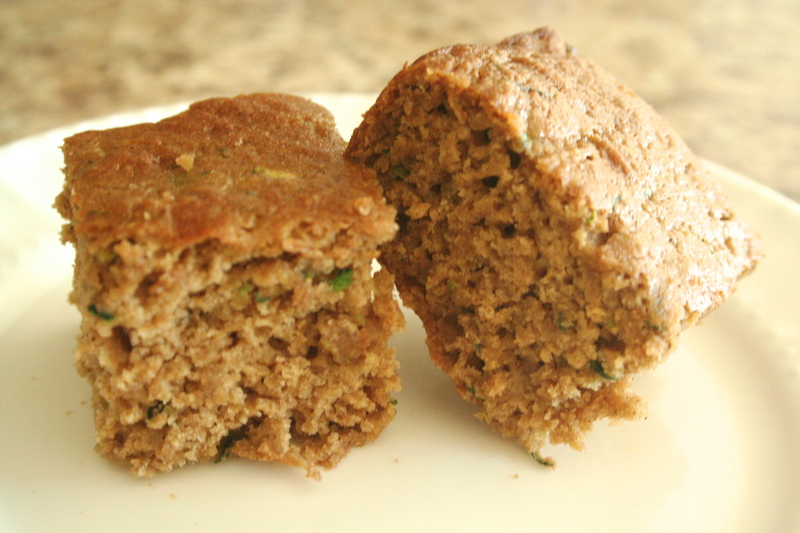 Well first of all there are super easy to make, secondly you can customize them with whatever fruit or nuts or spices you have available, they are filling, quick and easy to make, and most importantly they are healthy AND delicious. I love oatmeal for breakfast. It’s filling and packed with fiber to help keep me full all morning at work so I’m not starving by lunchtime. Not only is the fiber in oatmeal good for keeping you full, but it is also good for your heart. I am sure you have all seen those Cheerios commercials talking about how they can help lower your cholesterol. Well that’s because Cheerios are whole grain. Just like oatmeal! The soluble and insoluble fibers in oatmeal and other whole grains are associated with and increase in diet quality and a lower risk of heart disease. Soluble fiber is even shown to slightly reduce LDL (bad cholesterol) beyond what is achievable by a diet solely low in saturated and trans fats (“Whole grains and,” 2013). The one downside about eating oatmeal in the morning is that it’s not very portable, you have to eat it with a spoon and if you are like me, I like to add some fresh or frozen fruit to it too. So, sometimes when running late it’s hard to take those extra few minutes to warm up my oatmeal* then sit down and eat it before I leave for work at 6:50am. 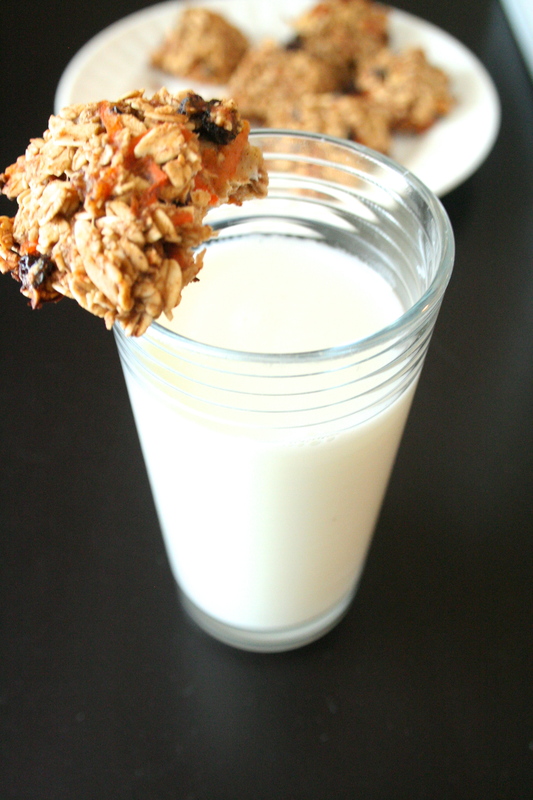 That is what is so wonderful about these oatmeal bites. I can just grab a few running out the door and bring them to work for breakfast or a midmorning snack. 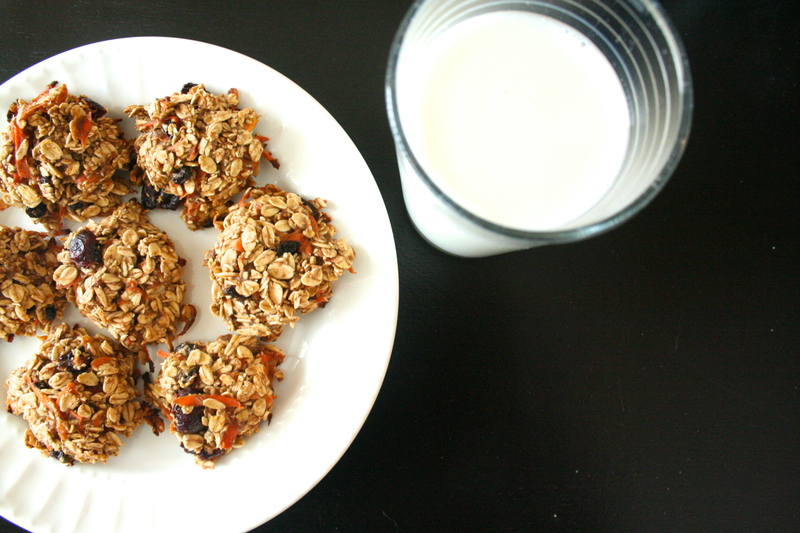 * Quick tip: You don’t have to use instant oats for quick oatmeal. You can microwave old fashioned rolled oats just as fast. Just add water and pop it in the microwave for 1-2 minutes, depending on how done you like it. I only do 1 minute because I like them with a little more texture. 2 cup quick oats ( if you don’t have quick oats like I didn’t, just chopped old-fashioned oats in a food processor). Mash the banana in a medium mixing bowl and all of the ingredients. Mix well, and spoon onto a greased cookie sheet. Starting about two weeks ago, every Wednesday at work some local farmers come in and set up a table to sell their produce. I love it, I can’t not buy something! Its fresh and its local, how can I turn that down? They are so smart to sell all that beautiful, fresh produce so conveniently at work. It saves me a trip to the store and I feel better supporting local farmers. This week they had the most gigantic zucchinis I have ever seen. No joke, they were all about 12+ inches long and 2 and a half inches in diameter. So naturally, I bought some then I had to figure out how to use all of the zucchini and of course, zucchini bread is the first thing I think of. Especially since I have been craving it since zucchini season started. 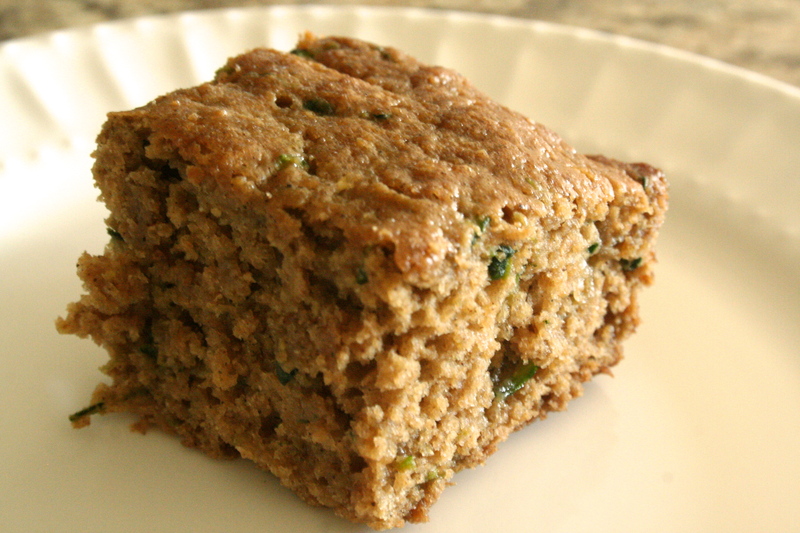 There is nothing better in the summer than a good loaf of zucchini bread….okay, maybe that’s pushing it. Ice cream is pretty awesome, and Lake Michigan better yet beach bonfires on Lake Michigan…So maybe it’s not the best thing about summer but it’s at the top of the list. You get the idea. Well, Since going gluten-free I have not done a ton of baking. This is one of the first gluten-free baked goods I have made and personally I am a little impressed with myself. I took them to work today and if I hadn’t told people they were gluten-free they never would have guessed. I think I will call that a success! Let cool before cutting and enjoy!! Oh my, I have been absolutely horrible lately. It’s been so long since I have made a post that I almost don’t know what to do! Life has just been crazy. With my new job and summer traveling I have been a lazy bum. By the time I can sit down, that’s all I want to do. So, starting now I am making a new rule that I will be better about keeping up with my blog. I wasnt joking about my pictures being horrible. Along with that train of thought, I am thinking my blog needs an overhaul. But seriously, my photographs are not doing my food justice at all….but I guess that’s what you get when you don’t own a real camera, not to mention It could use some re-organizing. At least now that I have a camera they will get better…hopefully. To get back into the swing of things I have been collecting a few recipes I have been meaning to post. This first one is one of my favorite dishes to bring to potlucks or to have as an easy, delicious and healthy appetizer anytime of the year. Are you ready for it? 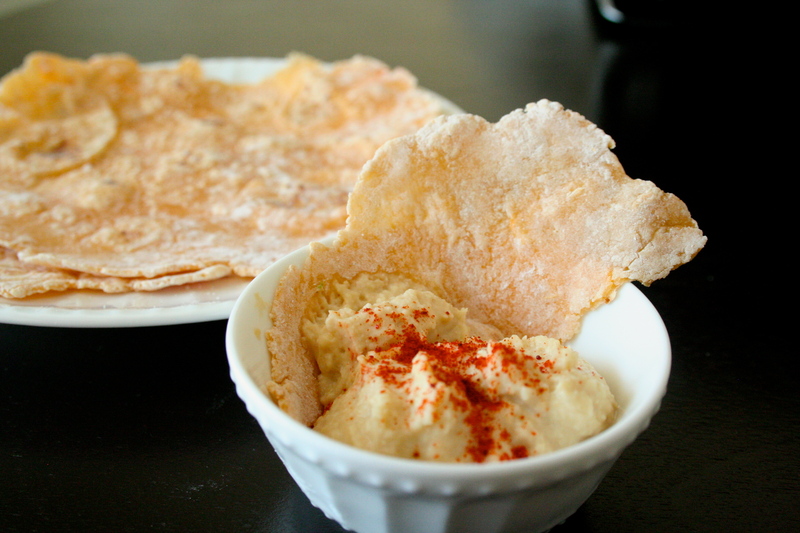 It’s a Greek hummus dip and it is SO GOOD, yet so simple. I brought this to a tailgate once and it was gone in about 5 minutes…I’m not joking, I didn’t even get any. Same thing happened when I brought it to a recent work potluck. So, if you make this for a party or potluck make sure you snag a bite before you set it out or you will never get a chance to taste this delicious dip. In an food processor or blender add drained chickpeas, tahini, garlic, lemon juice, salt and pepper. Start with about a tablespoon of olive oil and blend. When it comes to adding the more olive oil or chickpea liquid it becomes personal preference from now on what consistency you like your hummus, it also varies depending on how juicy your lemon is. I personally don’t like to add a ton of olive oil, so if I have already added a good amount and It is not quite the consistency I want I will add the chickpea liquid, but if you don’t want to use the chickpea liquid you don’t have to. Just blend till you get the a good creamy texture. Start by spreading the hummus into a glass baking dish. Next, spread the Chobani over top, you may need a little more or less depending on the size of your dish. I used a 9X12, I have also used and 8X8 and got away with just one container or yogurt. 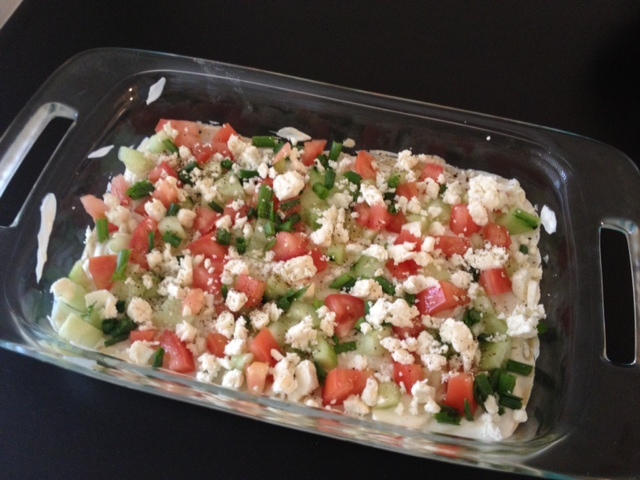 Sprinkle yogurt layer with feta, tomatoes, cucumbers and green onions, then top with some fresh cracked pepper….I told you it was easy. Now pair that with some of crunchy corn chips (I like Trader Joe’s guiltless corn chips) or pita and hurry up and grab a bite before it’s all gone! Wow I can’t believe how time has flown. It was February the last time I made a post, but things have been pretty crazy for me the last two months. Good news is I finally got a job! I am incredibly excited about it and love it so far. So things have been kind of hectic and It has taken me a little time to get adjusted to my new place and having a working schedule but I think I am finally settled in enough now to start back up with my blog. One thing that has been very important for me with the move is making sure that I maintain my healthy lifestyle while staying within my budget. Living alone does present some problems when it comes to buying groceries and cooking, when I buy my fruits and veggies I need to make sure that I can use them before they go bad. Cooking can be a challenge too, when I make something its sometimes hard to make enough just for one but I don’t really want to be eating the same thing all week either. So I have come up with a sample grocery list and a few tips for those of you out there dealing with the same problems. 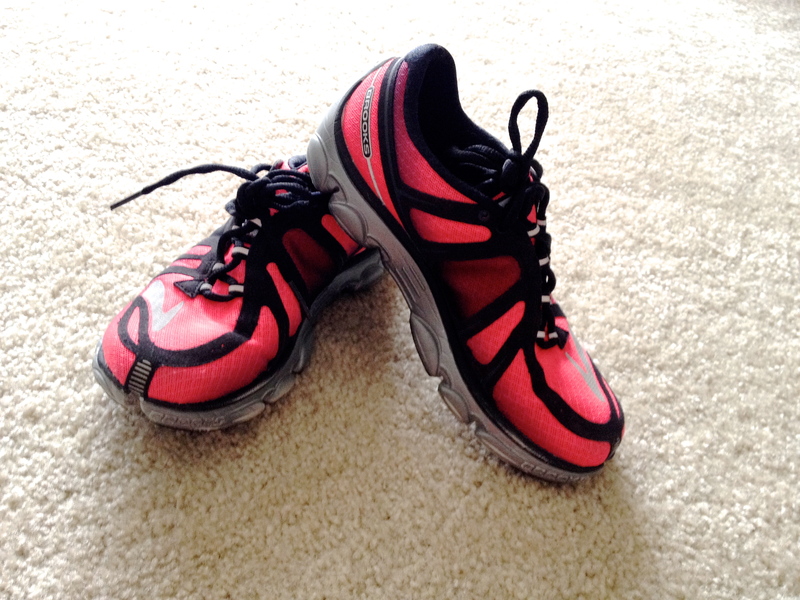 Things that have worked for me so far and hopefully will help you stay healthy on a budget. Unripe avocado- if you buy and avocado at the beginning of the week before it is rip and you don’t plan on using it right away keep in the fridge it will ripen more slowly and that way you can have one around for when you want it later in the week. Frozen corn and peas-These are always great to have around. You can throw them into soups stews and stir-fry’s for a little color and sweetness or de-thaw small amounts at a time to add to a salad. Canned un-pickled beets- great for adding to a salad during the week not only are they delicious but packed with vitamins! Canned Chickpeas/Garbanzo beans- Another great addition to salads and a vegetarian source of protein. They can be roasted and turned into a salty snack, mashed into a humus or curried and poured over rice for a vegetarian dinner. The possibilities are endless! Canned black beans (low sodium)- I loved having canned black beans around they are great for adding to salads, or rice or for making vegetarian tacos or burritos. Frozen fruit- Let’s face it we can’t always have fresh fruit on hand. So for them times when we can’t frozen unsweetened fruits are a lifesaver! I love to have a bag around to use for topping my vanilla Chobani yogurt or low-fat cottage cheese. Its perfect for a quick snack or breakfast! If you prefer them thawed just take some out the night before and store in a Tupperware in the fridge. If you forget, just zap them in the microwave for a few seconds till they are thawed but not hot. Eggs- always a great option, cheap delicious and healthy plus they work great for breakfast lunch or dinner. Fish- of course fresh is always a better fresh, but can get expensive and hard to buy the day you want it. I try and stick with Trader Joe’s frozen uncooked shrimp or frozen cod. Chicken- when I buy a pack of chicken breast I always trim and butterfly them right when I get them home. I then put the two halves into freezer bags and freeze them so they will be ready to use later. That way they are portioned perfectly and I get two meals out of them! Beef/pork/other meats- Personally I don’t buy a lot of other meat, if I do these are things that I buy usually the day of, but you could use the same method for these meat as I do for the chicken. GREEK YOGURT- I LOVE this stuff. Chobani and Fage are definitely the two best kinds in my opinion as far as consistency, flavor, protein and sugar content. I usually buy the big vanilla 32 oz container from Chobani its cheaper than buying the individual flavors and that way I can flavor it with my own fruit. 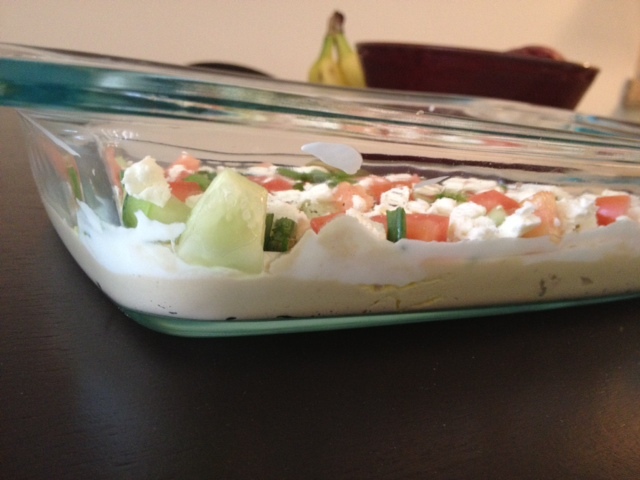 Plain Greek yogurt is also great to have and makes a great substitute for sour cream. Use it to top tacos or baked potatoes you can’t even tell the difference! Low-fat cottage cheese- Makes a great sweet or savory snack. Add fruit or veggies or just eat it plain its delicious and satisfying. 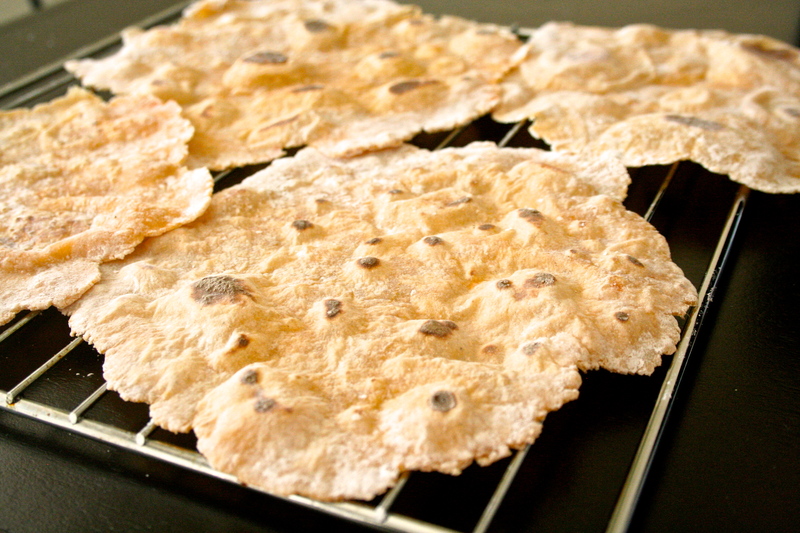 For a real treat, top some whole grain crackers with it. Quinoa- quick delicious and incredibly versatile, not to mention a great source of protein. Old fashioned rolled oats -none of this instant stuff. 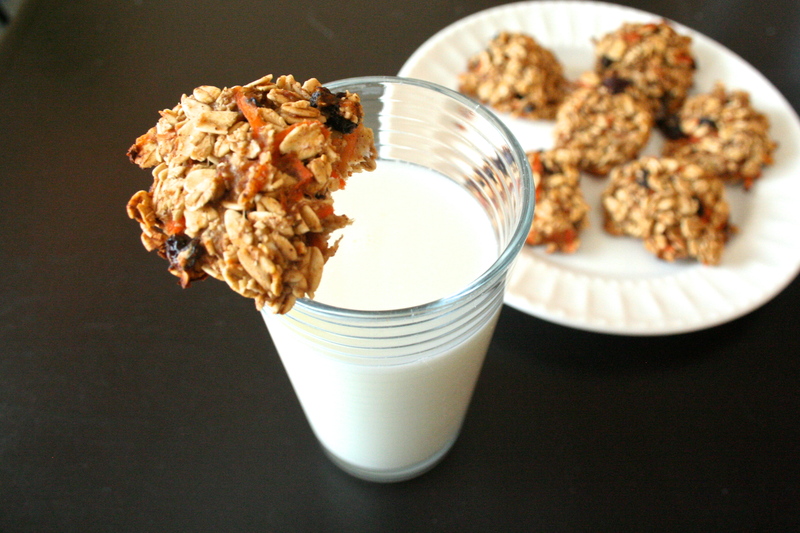 Old fashioned rolled oats are just as quick. Add some water and put it in the microwave for a minute and its cooked, the instant stuff is just too mushy! Popcorn kernels- Since I started making my own popcorn on the stove top about 7 years ago I can’t go back to the microwave stuff. There are a lot of benefits to buy the kernels, its cheaper, healthier and you can make as much as you want. For three tables spoons of kernels (that’s about a serving) I use 1 tsp of olive oil for popping. Add a little melted butter or margarine when it’s done and a dash of salt or any other seasonings of your choice. So there you have it. A little sample list of the things that I like to make sure I keep on hand week to week. Of course there are other things like cheeses and herbs and seasoning, occasionally breads that you will want to get for certain meals, and then of course things that you will already have at home. But for the most part it’s pretty easy to whip up a weeknight meal with this list whether its just grilled chicken and salad or a shrimp stir fry this list will pretty much cover it. One other tips I have for you is FREEZE YOUR LEFTOVERS. If you make a meal and have a ton of leftovers don’t make yourself eat the same thing for a whole week. Get some freezable Tupperware or freezer bags and freeze them. Most meals can be frozen, so freezing meals in individual serving sizes is always a great idea. That way if you have a busy day you can just come home and microwave your meal. So instead of buying frozen meals you are just making your own its much healthier and much more economical. Omega-3 fatty acids– Many nuts are rich in omega-3 fatty acids. Diets with a higher intake of omega-3 fatty acids have been shown to have a decreased risk for cardiovascular disease and cancer. Omega-3 fatty acids also help manage irregular heart rhythms, which can lead to heart attack. Other sources of omega-3 fatty acids include fish and some greens and seeds, but nuts are the best vegetarian source. 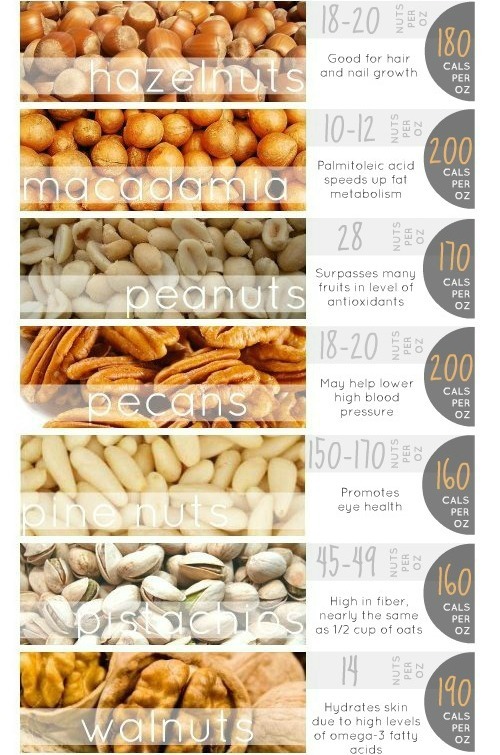 Fiber– All nuts contain fiber, which can help you lower your cholesterol. 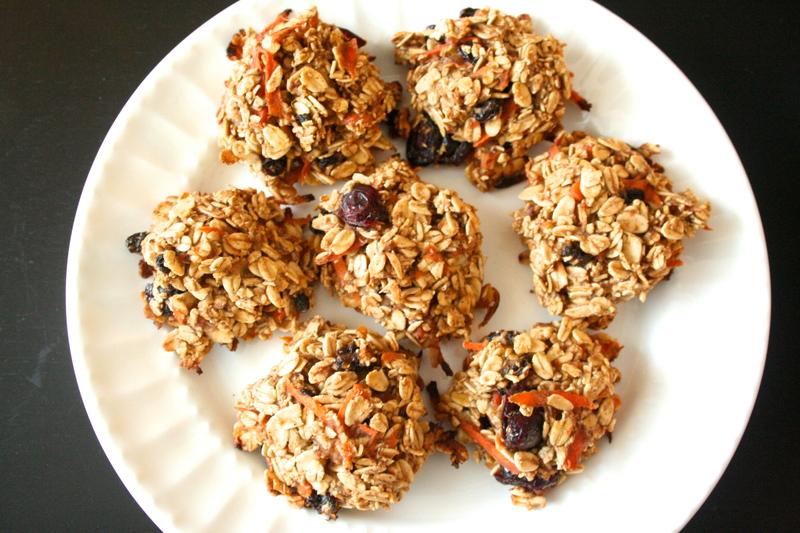 Fiber also helps you feel fuller longer so it is a great snack in the middle of the day to keep you energized. Vitamin E– Vitamin E is thought to help stop the development of plaque in the arteries. The development of plaque can lead to chest pain, coronary artery disease or a heart attack. Vitamin E is also essential for healthy skin, proper immune function, DNA repair and other metabolic functions. Plant Sterols– Some nuts contain plant sterols which can help you lower your cholesterol. Plant sterols are often added to margarine and orange juice for the extra health benefits but are found naturally in nuts. L-arginine– L-arginine is an amino acid that has been shown to improve blood vessel function. Specifically, by helping the blood vessels relax, allowing for better blood flow and reducing the risk for blood clots. It has also been shown to boost immune function, promote wound healing and manage existing cardiovascular disease. Walnuts, peanuts and almonds are especially high in L-arganine. Valentine, Jennifer, ed. “Health benefits of nuts .” One Green Planet . N.p., 2 Mar 2011. Boil the chicken until cooked through, using two forks shred the cooked chicken. In a large nonstick skillet sauté onions in olive oil till fragrant, add the shredded chicken and enchilada seasoning and follow the instruction on the packet for how much water to add. Bring to a boil and add frozen corn and black beans, cook till warmed through and water is evaporated. Divide the chicken mixture into 6 servings, scoop each serving into one tortilla shell, roll and place into a glass-cooking dish. 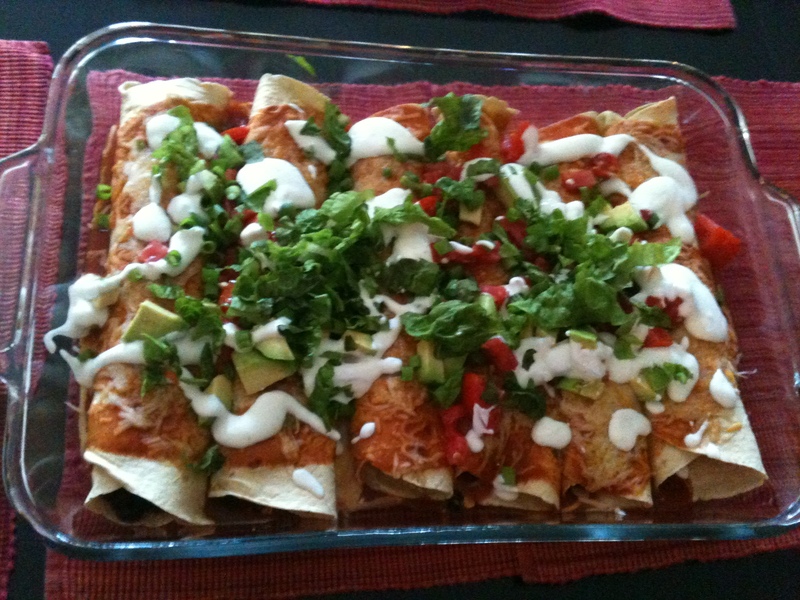 Pour enchilada sauce over the enchiladas, sprinkle with the cheese and place it in the oven on broil. Broil it long enough till the cheese is melted and starting to get a little crispy, make sure to keep an eye on it, it melts fast! Garnish with diced tomatoes, avocados, green onions, lettuce and yogurt sauce or any other toppings you like and enjoy! Note: you can add more or less agave/honey or lime juice, it just depends on how sweet or tangy you like it. I prefer it tangier.